In preparation for an ascent of Mount Whitney, I twice went up the summit of the local 10,000 footer, Mount San Antonio, also known as Mount Baldy or Old Baldy. This is a nice fairly demanding hike that helped me get into shape for the much larger climb I would be doing in a few months. On both trips, I brought my photo gear to capture beautiful images along the way and also just to have some extra weight for conditioning. Of particular note on the first trip were the crazy cloud patterns. 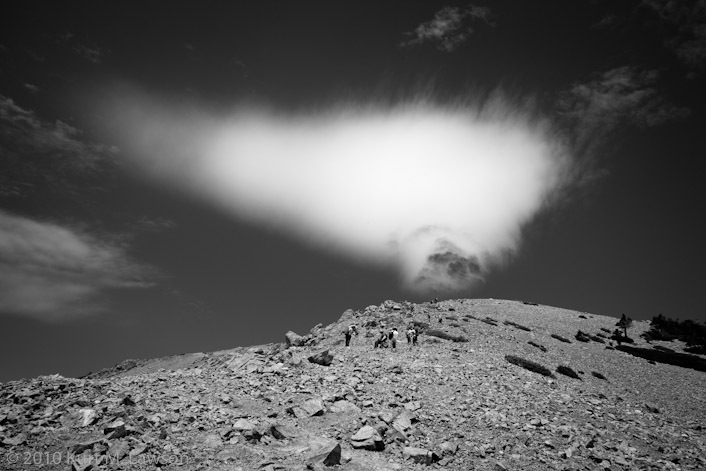 I watched as clouds passed over the summit and were seemingly destroyed by the crazy air currents circulating overhead. It reminded me of a photo by the famous Galen Rowell called Split Rock and Cloud (you can see a copy at amazon on a poster here). Having seen a print of this picture in person, I had always pondered the clouds, and even thought they were somehow unreal. 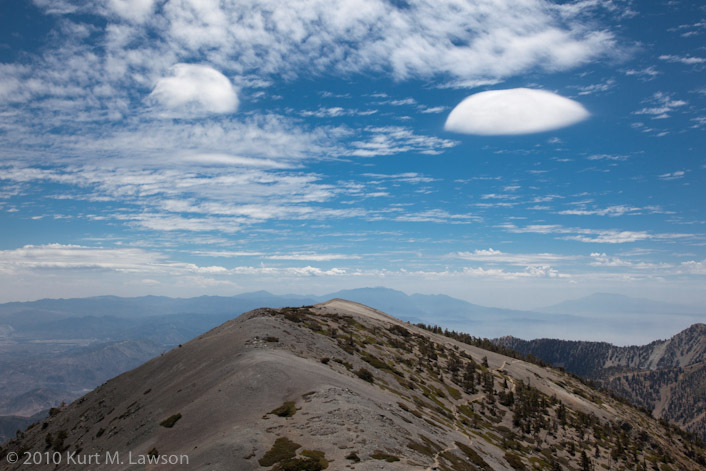 But, here on the slopes of Mount Baldy I was witnessing the same phenomenon right before my eyes. I set up the camera on my tripod and captured a little video of the phenomenon. 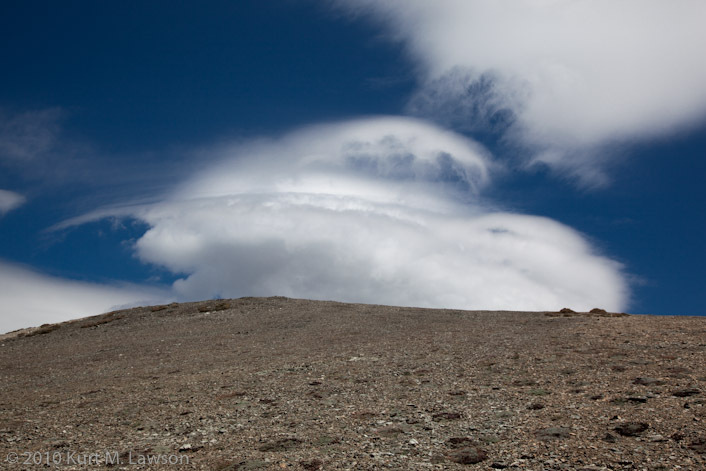 The wind and cloud patterns also produced a couple of UFOs over Mount Harwood. On the second trip up I captured this couple sitting by the Sierra Club Ski Hut enjoying the mountain environment. And finally a quick shot of the Devil’s Backbone section of the trail from the ski lift. Climbing Baldy allows for a diverse selection of mountain landscapes, and a big broad summit where you can hang out and eat lunch. It’s a strenuous enough workout to help get you into mountaineering shape and I will be going back again and again next summer for sure.